As promised in my recipe for Banana Swirl, here is the recipe for Veggie Spaghetti! It was inspired by one of my favorite episodes of Daniel Tiger’s Neighborhood (yes it is a kid show, and I absolutely love to watch it with my son!). The episode is called “Daniel Tries a New Food”, when his mom makes Veggie Spaghetti and Banana Swirl. I am secretly hoping if I have delicious recipes that go along with the shows my kids watch, they will have one more reason why they love healthy foods! Well whether you watch Daniel Tiger or not, Veggie Spaghetti is an awesome recipe! It is so hearty and delicious and so full of nutrients too! It is hard not to like something that tastes the way this Spaghetti tastes. It is especially great for this summer season, when all the produce is starting to come on! Fresh summer Squash, carrots and bell peppers from your own garden or the farmers market would be perfect for this recipe! You will also get the very best results if you use fresh basil, but if this is unavailable to you, I have also used dried basil and it also has very nice results. I also personally like to leave the skins on my summer squash, for a little extra texture and fiber, but you can peel it off if you prefer. Saute the ground beef and onions in a large pot, over medium-high heat. Once browned, add the tomato sauce, chopped tomato, bay leaf, sugar, garlic powder, basil, salt and water. Allow this sauce to simmer, covered, for 10 minutes, stirring frequently. Add the summer squash, bell pepper and carrot to the pot. Allow the sauce to simmer for an additional 10 minutes (or until the sauce is thickened and no longer tastes raw), covered, stirring frequently. 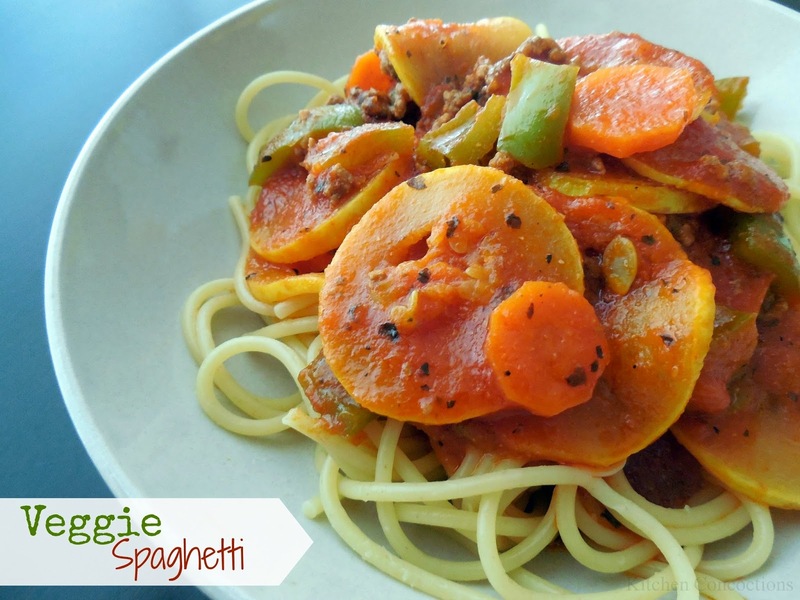 Serve the Veggie Spaghetti over cooked spaghetti noodles.